Over a third of property investors want buy-to-let lenders to apply a manual underwriting process for professional landlords, as they struggle to obtain buy-to-let mortgages off the high street. 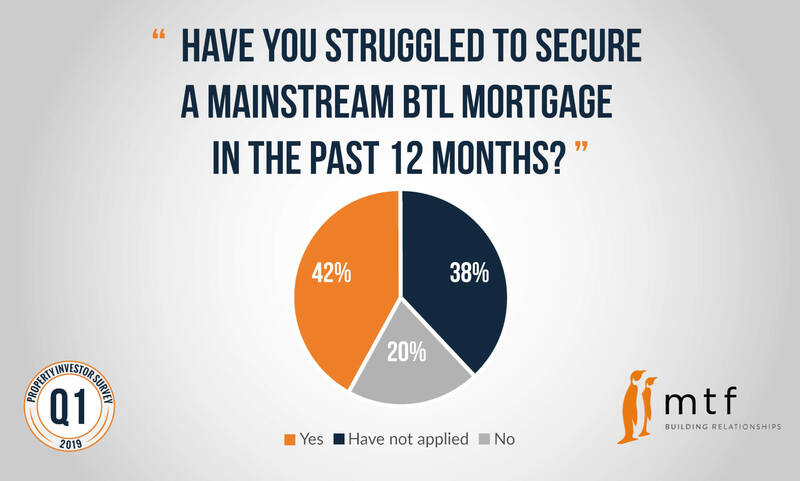 The results from MT Finance’s latest property Investor Survey showed that 42% of property investors said they had struggled to secure a mainstream buy-to-let mortgage in the last 12 months, with 54% citing affordability criteria as the primary barrier to mainstream funding. This was followed by age restrictions at 32% and insufficient deposit capital at 14%. 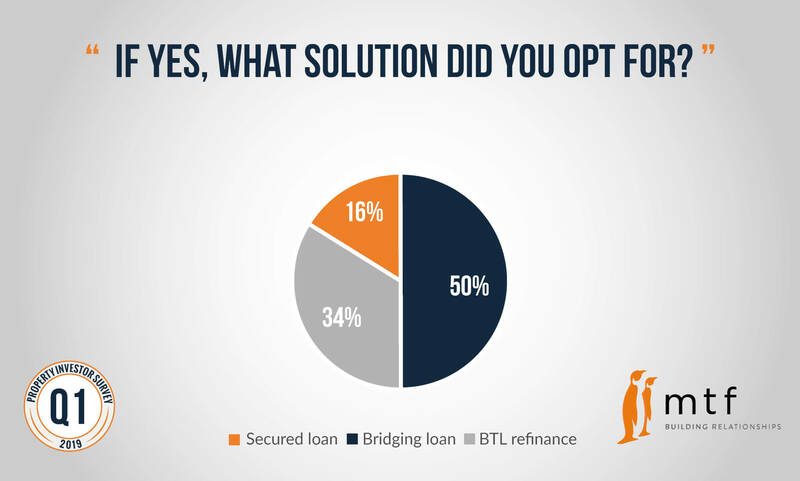 Yet, 46% of those unable to obtain a BTL mortgage filled the funding gap with other sources of liquidity, as 50% of those opted for bridging loans, 34% refinanced through a specialist BTL lender, and 16% opted for a secured loan. 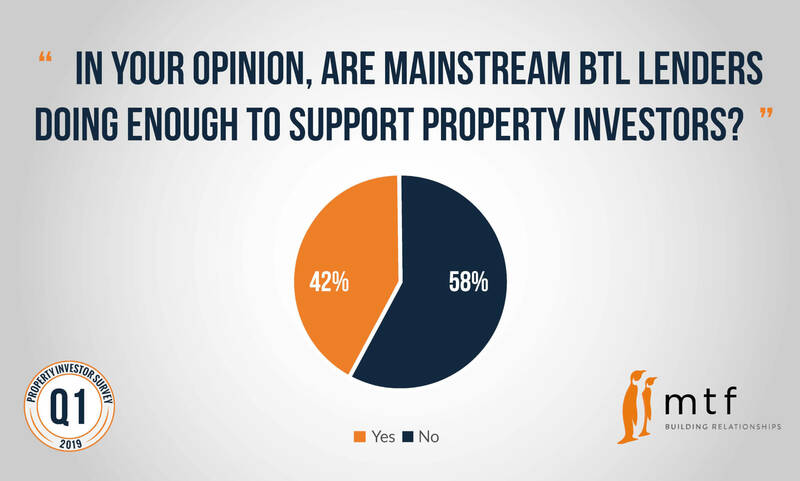 As a result, 58% of the 125 property investors surveyed do not think buy-to-let lenders are doing enough to support them. When asked what mainstream buy-to-let lenders could do to better support them, 36% said applying a manual underwriting process for professional landlords would better support them, followed by increasing LTV thresholds at 32% and relaxing age restrictions at 26%. The results from our Q1 2019 Property Investor Survey reflects the impact of stricter affordability and stress testing from high-street lenders on professional property investors’ ability to obtain mainstream funding. The need for reliable, transparent, and quick access to funds is ever-critical and specialist finance- such as bridging loans, will continue to pick up when a more personalised approach to underwriting is required. 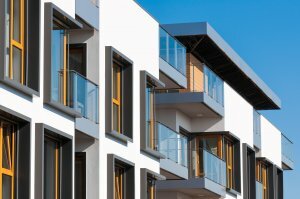 With highly professional specialist lenders offering flexible products at competitive rates, bridging finance has become an attractive proposition to those property investors who are looking to expand their portfolio and need certainty when conducting their business and who often need to move swiftly to capitalise on an opportunity. For more information on how a bridging loan could help you purchase an investment property, call us on 0203 051 2331 or fill in our contact form and a member of the team will be in touch to discuss your enquiry. We are delighted to announce we have entered into an agreement with a Global Institutional Investment Manager with over $1.6 Trillion of assets under management. Under the agreement, the Fund has committed to initially acquiring up to £100m of bridging loan assets from the company. This new agreement follows a similar agreement entered into with the same Investment Manager in 2017 and reflects the successful performance of MT Finance in the past two years. It follows MT Finance having successfully secured £50m in funding from Insight Asset Management in December 2018. MT Finance is now uniquely placed in the short-term lending sector to continue to support property professionals, business owners, and individuals with their finance requirements in the months and years ahead. 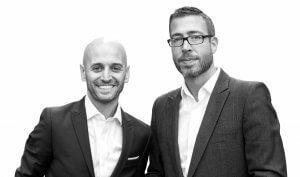 Established in 2008, by co-founders Joshua Elash and Tomer Aboody, MT Finance has grown to become one of the largest specialist lenders in the UK. MT Finance’s reputation in the market excels for delivering fit for purpose bridging loans at sensible rates, and its approach to lending is something that has been consistently recognised within the financial services industry with the company winning various sector awards including Best Short-Term Lender at the Mortgage Strategy Awards 2019. 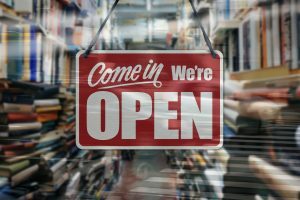 According to the British Business Bank’s latest Small Business Finance Markets report, a large proportion of UK SMEs expect access to funding to become more difficult following the UK’s departure from the European Union. SMEs are a critical part of the UK economy, accounting for around 60% of private sector employment and half the annual turnover of all private sector businesses but many have struggled from a lack of liquidity following the financial crisis, amalgamated with uncertainty surrounding Brexit. Banks have been particularly wary of lending to smaller businesses, concerned that a no-deal Brexit could result in a slowdown of the economy and impact on their ability to pay back loans. However, over the past decade, there has been significant developments from the alternative finance industry that have given SMEs a wider choice of ways to finance their aspirations. Today there is a whole range of non-bank funding solutions successfully lending to small businesses and one such source that has become a critical tool to fund the SME community is bridging finance. There is an array of instances where bridging finance is the ideal solution for companies needing quick access to funds or to plug a gap that traditional lenders are unable to fill. Whether funds are needed to acquire stock, to facilitate a new venture, or provide additional capital to stimulate growth. 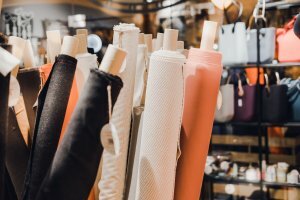 As an example, MT Finance was recently approached by a client who owned a successful textile manufacturing company and as part of his growth strategy, was looking for funds to help him acquire a similar company. As part of the acquisition, the client was able to take over an existing contract for materials and products from Southeast Asia, including a shipment that had already been approved and prepared. However, the sellers had a specific completion date which meant the client needed to move quickly to take advantage of the opportunity. He had attempted to borrow against his main residence, valued at £950,000, which had an existing first charge mortgage of £295,000. However, his existing mortgage lender was unable to provide additional funding against the property in the time-frame required. Due to time sensitivity, the client’s broker contacted us straight away. On receipt of the enquiry, we were able to give an immediate decision and issued the offer in principle that day. As we were faced with roughly 2 weeks to deliver the funds, we immediately instructed the valuation at the same time as going to offer. In just 13 days, we provided the £275,000 second charge bridging loan, at 60% LTV, based on the current open market value of the client’s property. Interest was retained at 0.85% over 12 months, with no exit fees or early repayment charges. No personal guarantees were required. Our bridging loan meant the client was able to complete the acquisition by the specified completion date and capitalise on a fantastic investment to his business. Within 9 months the client was able to show a trading pattern and increased income that allowed him to raise funds to exit our loan. For those SMEs relying on traditional bank loans for finance means there’s a large segment of the SME community that isn’t benefiting from access to funding when they otherwise should be. Alternative finance products such as bridging loans, crowdfunding, and invoice finance can help business owners access the most appropriate finance for their needs from this more diverse market. It’s certainly been a tough time for business owners over the last decade, but as traditional lenders fail to meet expectations, alternative lenders are indeed stepping in to meet the needs of SMEs. MT Finance is committed to supporting the SME sector- since 2008 we have been delighted to help UK SMEs invest in manufacturing, technology, and development of their businesses. For more information on how we could help support your business, call us on 0203 051 2331 or fill in our contact form and a member of the team will contact you shortly to discuss your requirements. We are pleased to announce that we have appointed Jamie Gillespie as business development manager covering the Midlands and North of England areas, to support our continued regional expansion. 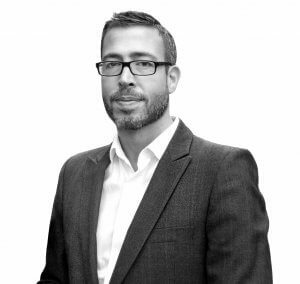 He will work alongside the Company’s existing team of BDMs, headed up by Commercial Director, Gareth Lewis. Jamie previously held roles at Freedom Finance and Fluent Money, and more recently with Seneca Bridging as business development manager. The appointment is our second hire outside of London, following the recruitment of Richard Sherman as BDM for Wales and the South East in September 2018. 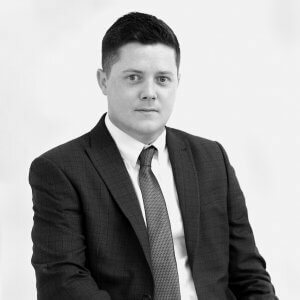 “We have been looking to strengthen our sales team and broaden our reach in order to support introducers across the country, and Jamie’s appointment is testament to this. An increasing number of people in need of extra funds are turning to second charge bridging loans to purchase investment properties, inject capital into businesses, or make refurbishments in order to prevent disturbing their existing attractive mortgages. Demand for second charge lending is set to increase throughout the year. In a sustained low-interest rate environment, it now often makes more sense for a borrower to release equity on a property by taking out a second charge, rather than the prospect of refinancing away from their current deal. A second charge bridging loan could be the ideal solution for those who already have a mortgage secured against their property but requires further funds for a short period of time. Second charge bridging loans can be used for many reasons, such as purchasing an investment property, business expansion, and redevelopment of an existing property to name but a few. A second charge bridging loan sits behind an existing loan or mortgage. If there is enough equity left in the property to secure another loan against it, a second legal charge may be taken out. A second legal charge can be secured on all property types, including buy-to-let, residential and commercial assets, and typically has a 12-month maturity, unlike a secured loan which is a form of longer-term financing. As it sits behind a first charge loan, a second charge will always require consent from the first charge lender and is usually more expensive than a first charge, reflecting the additional risk taken by a finance provider. 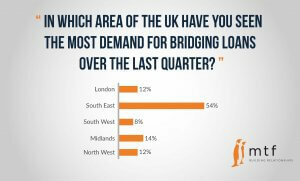 When are second charge bridging loans beneficial? Using a second charge bridging loan means you keep your existing mortgage rate. There would be no changes to the existing mortgage terms and conditions. A second charge could allow for more flexible repayment terms, which could potentially save thousands of pounds in interest. If you must pay a large penalty for stopping/switching your existing fixed rate mortgage early, a second charge loan may be cheaper as the existing mortgage stays in place and the penalty is not charged. It would be beneficial to run a cost comparison in this scenario. Mortgage rules have become stricter in the past couple of years, with lenders applying tough ‘stress’ tests to make sure borrowers can meet repayments if interest rates rise. However, second charge bridging loan providers don’t rely on the same tests and can tailor a solution to suit your individual borrowing needs. Second charge bridging loans are also particularly helpful for those with unusual income structures, such as the self-employed, or those with complex financial backgrounds. Where a mainstream bank may take several months to put together a loan for a borrower, a bridging finance company is often able to make lending decisions within hours of initial enquiry, so funds can be released quickly, sometimes even in less than a week. A second charge bridging loan can be a useful tool for those who simply need a rapid cash injection. You can borrow a maximum of 70% loan-to-value and loans can be arranged from £100k to £5m. The actual amount will depend on the available equity in the property and affordability of the loan. 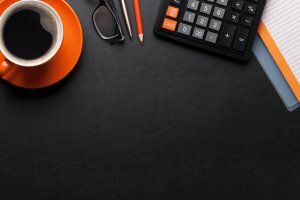 How can MT Finance help? At MT Finance, we believe a second charge bridging loan is about empowering borrowers to enable them to take advantage of time-sensitive opportunities that can make or save them money. As an example, we helped a client who required £349,000 second charge loan on her £8.5m property. The client was part way through refurbishing her investment property, but the process had been delayed. She didn’t want to remortgage as she intended to sell the investment property as soon as the refurbishment works on it were complete and didn’t want to be penalised for early repayment. In just 12 days, MT Finance provided a £349,000 million second charge bridging loan at 39% LTV. Interest was retained over 12 months, with no exit fees or early repayment charges. No personal guarantees were required. Our second charge bridging loan gave her time to carry out the works and significantly increase the value of her investment property. The client will sell the investment asset to exit the bridging loan, against the higher value. Second charge bridging loans will continue to offer significant financial savings for a wide range of borrowers, not just those who may struggle to obtain finance through traditional routes. 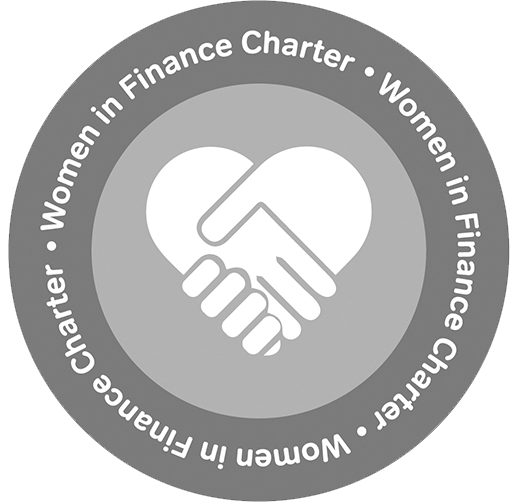 MT Finance is a multi-award-winning bridging finance lender and we have many years’ experience and know-how when it comes to second legal charges. We assess every single application for a second charge loan on a case by case basis, assessing each case on its own merits. Our flexible approach means we can structure your second charge bridging loan to your exact requirements and allows us to make quick decisions and deliver funds at speed. We also do not charge any exit fees or early repayment fees and do not have any lengthy and tedious application forms for you to fill out. Our entire application process is quick and easy and with highly competitive interest rates and no upfront fees, we offer a fast, transparent, and stress-free service. Contact us today by calling 0203 051 2331 or filling in our contact form. Our team are on hand to discuss your second charge bridging loan enquiry and will be happy to answer all your questions and allay any concerns. Please note that if the second charge loan is secured on a residential property, it must be for business use only. 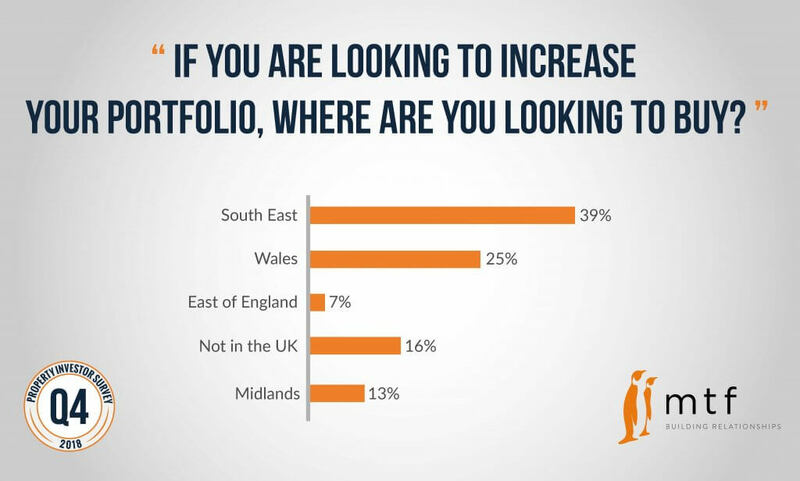 A majority of UK property professionals are set to expand their portfolios in 2019, remaining resilient despite a backdrop of uncertainty and squeeze on affordability. We polled property professionals as part of our research into the future performance of the UK property sector. 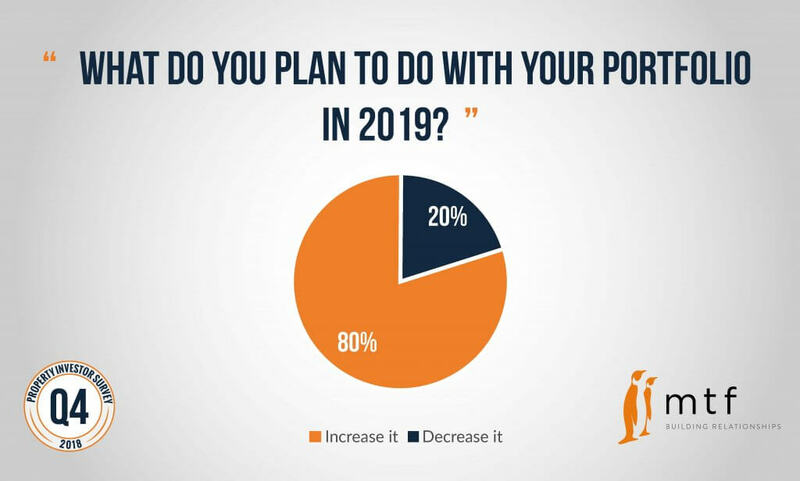 80% of investors said they plan to increase their portfolios in 2019, while 20% said they are not making any changes to their portfolio in 2019. Nobody questioned planned to reduce their exposure to the UK property market this year. 2018 was another challenging year for property investors in the UK, as Brexit negations continued and finances were squeezed by tax changes. 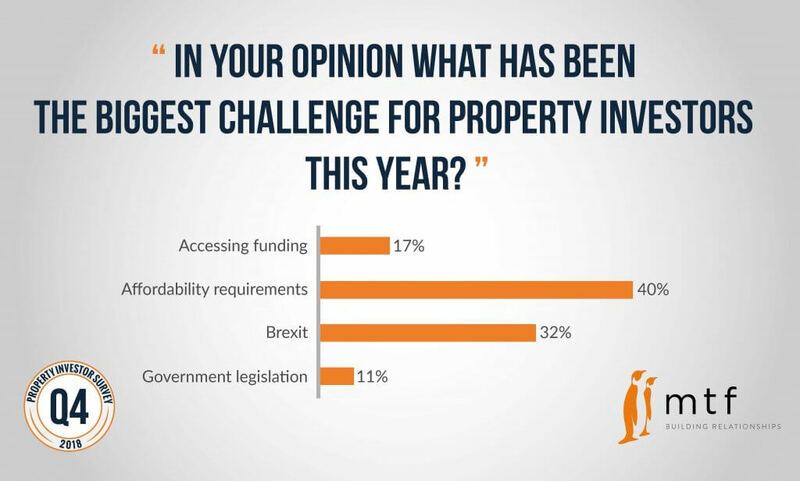 When asked what the biggest challenge for property investors had been last year, the majority (40%) of respondents cited affordability. Ongoing Brexit uncertainty was the second biggest challenge at 32%, followed by accessing funding at 17%. Some 11% said Government legislation was the biggest challenge in 2018. During 2018, 48 of the 101 respondents revealed they had purchased residential properties as investments and 43 respondents had bought commercial properties. 21 said they bought foreign properties as investments. 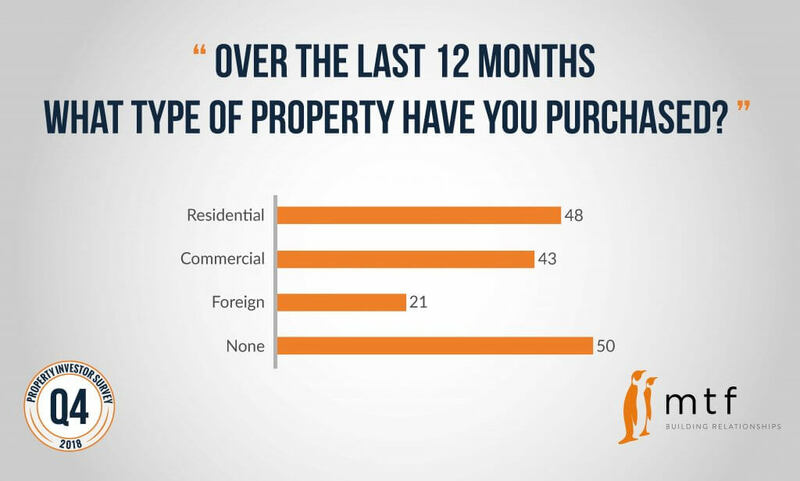 Whilst the majority (50 respondents) said they didn’t purchase any property in 2018. The UK property market has seen a reduction in high-value purchase transactions. This is reflected in the latest data from HMRC, who revealed stamp duty receipts fell by £1 billion last year. The results from our Q4 Property Investor Survey highlight how higher stamp duty and a lack of affordability has pushed property investors out of London, where more rental properties are vital. While there is continuing uncertainty, particularly over how the Brexit negotiations will unfold, UK property investors remain resilient. The fact that property professionals have revealed they will continue to invest in the UK, despite the uncertainty and numerous challenges, bodes well for the future of the market. To find out more, speak a member of our team on 0203 475 0176 or click here to fill out our quick enquiry form. Despite the turbulence in the financial markets, bridging finance displayed positive development in 2018 and maintained favourable liquidity, particularly in the second half of the year, according to the latest Bridging Trends data. Bridging loan volume transacted by contributors hit £766.9 million in 2018, an increase of £232.8 million on the previous year. This is the highest annual gross lending figure to date and comes as four new contributors joined Bridging Trends in 2018: Clever Lending, Complete FS, Pure Commercial Finance, and Y3S. The split between 1st and 2nd legal charge bridging loans remained consistent throughout 2018, with first charge loans accounting for 83% of the market in all four quarters. Second charges accounted for an average of 17% of total market volume in 2018 – the same average volume as in 2017. In 2016, 18% of bridging loans transacted by contributors were second charges. A significant portion of bridging loan activity was unregulated in 2018, at an average of 64% of all transactions. Whilst regulated bridging loans decreased market share on previous years to an average of 36% in 2018, compared to 46% in 2017, 44% in 2016, and 37% in 2015. Average loan-to-value levels increased in 2018 to an average of 55%, from 47% in 2017, and 49% in 2016. This could be attributed to higher LTVs being made available by new entrants in the space. Average monthly interest rates continue to fall year on year, demonstrating how bridging finance has become cheaper. The average monthly interest rate in 2018 was 0.81%, lower than in 2017 (0.83%) and 2016 (0.85%). 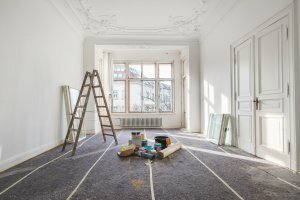 Funding property refurbishments was the most popular reason for obtaining bridging finance in 2018, with the average proportion of loans advanced for property refurbishments increasing from 23% in 2017, to 28% in 2018. Demand for bridging loans taken out for business purposes also increased in 2018, increasing on average from 12% in 2017, to 14% in 2018. 2018 was evidently a year where borrowers decided to opt for fast and flexible bridging loans to make improvements to properties and bolster yields, against the backdrop of Brexit uncertainty and legislation that has made it tougher to purchase new properties. Consequently, bridging loans for mortgage delays fell in every quarter in 2018. The average loan term in 2018 was 11 months. down from 12 months in 2017. 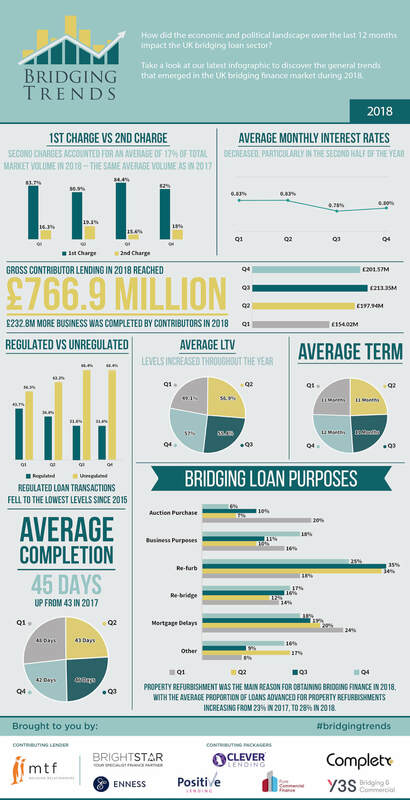 The average completion time of a bridging finance application averaged 45 days in 2018, up from 43 days in 2017. Average loan completion times were also 45 days for the year in 2016. 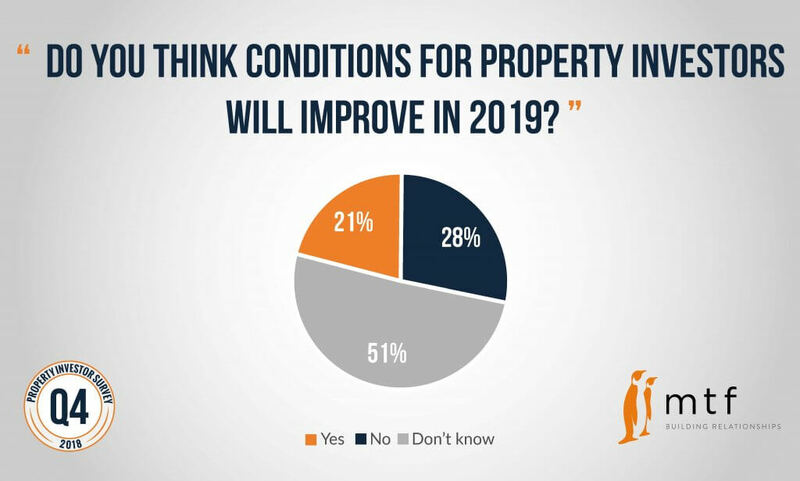 A majority of brokers are confident about the year ahead, according to our latest Broker Sentiment Survey with 42% of brokers predicting an improvement in market conditions in 2019. 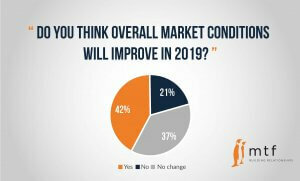 Some 37% of the 113 brokers questioned believe overall market conditions will remain the same in 2019, whilst only 21% of brokers surveyed said market conditions would get worse this year. 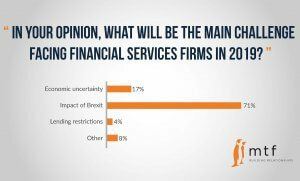 Almost three quarters (71%) of brokers surveyed said the impact of Brexit would be the main challenge for UK financial services firms in 2019, while 17% cited economic uncertainty, and 4% said lending restrictions would be the biggest challenge. Despite these challenges, demand for specialist finance is expected to remain strong, with 82% of brokers preparing for a further rise in bridging finance volume in 2019. 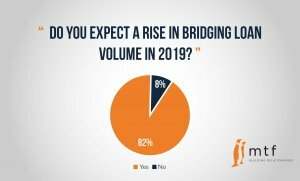 In addition, 75% of those questioned reported an actual rise in bridging loan volume in 2018. For the fourth consecutive quarter, funding a development project was the main reason borrowers took out bridging loans in the last quarter of 2018 at 33%, followed by property purchases at 29%. 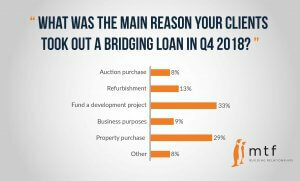 Whilst 13% of brokers said refurbishment was the most popular purpose for bridging finance in Q4 2018. For the sixth consecutive quarter, the South East saw the biggest demand for bridging finance in the UK during the fourth quarter of 2018, at 54% — a 7% increase on Q3 2018. The second highest area of demand was in the Midlands. 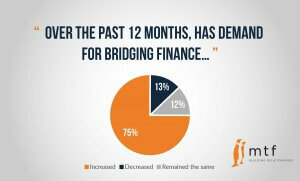 Only 12% of brokers noted demand for bridging finance in London, down from 41% in the previous quarter. We’re pleased to announce that MT Finance has appointed Cattrina Wigley as Senior Underwriter. Cattrina joins MT Finance from Octopus Property (previously Dragonfly), where she was a Credit Manager. 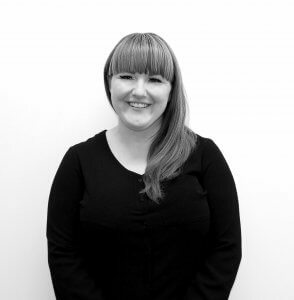 Cattrina has over 14 years of experience working in the financial services industry having started her career in 2004 as a fully qualified regulated mortgage broker. Cattrina previously held underwriting roles at several specialist finance firms including Castle Trust, before joining Octopus Property in 2014. In her new role, Cattrina will play a significant role in managing our lending process from application through to drawdown. Cattrina’s appointment comes alongside two recent further hires of an Operations Manager and a New Business Executive. “MT Finance has a fantastic reputation within the industry. I’ve dealt with them in the past and have always been impressed with the way they work. MT Finance Limited (“MTF”), an award-winning specialist short-term property lender, today announces the completion of new senior and mezzanine debt facilities to enhance its lending capabilities to the UK property finance market. MTF has raised up to £50m of senior funding from funds managed by Insight Investment alongside mezzanine funding from an unnamed UK fund manager. These new lines further diversify the funding structure of the business that currently includes a £125m committed forward-flow arrangement with a Global Institutional Investment Manager, as well as almost £100m from a portfolio of High-Net-Worth individuals. Established in 2008 by co-founders Joshua Elash and Tomer Aboody, MTF has quickly established its reputation for providing outstanding customer service and the ability to complete loans quickly. MTF has successfully completed in excess of £200m loans in the preceding 12 months and had a record month of originations in November. MTF’s reputation in the market excels for delivering fit for purpose bridging loans at sensible rates, and its approach to lending is something that has been consistently recognised within the financial services industry, with the company winning various sector awards including “Best Service from A Bridging Finance Provider” in the 2018 Business Moneyfacts Awards. MTF was advised by the Financial Services Corporate Finance team at EY. Lee Doyle, Matthew Pentecost, and Elizabeth Street-Thompson from the banking team at Ashurst LLP provided legal advice to MTF. Michael Lorraine, Kathryn James, and Annabel Rolls from the asset-backed finance team at Simmons & Simmons LLP provided legal advice to Insight Investment.